COMPASSIONATE CLIMATE ACTION: Climate EMERGENCY Countdown - Here's What We Have to Do! Finally, folks, I can tell you unequivocally what we have to do ... what you and your loved ones can do! Most of it is outlined in the best-ever emergency response to climate change: the Climate Action Network (CAN) International 2014 position statement. Please read through the countdown steps (below), then get as many of your friends, colleagues, family and community members to work creating political will as possible, using the addresses (also below). Use your power as a citizen to help safeguard the future! Tell the whole world. We finally have some power and a hope in hell … pass it on! The Climate Action Network June 2014 climate position statement is the best thing ever. We need to help them promote it, right now, as time is of the essence. 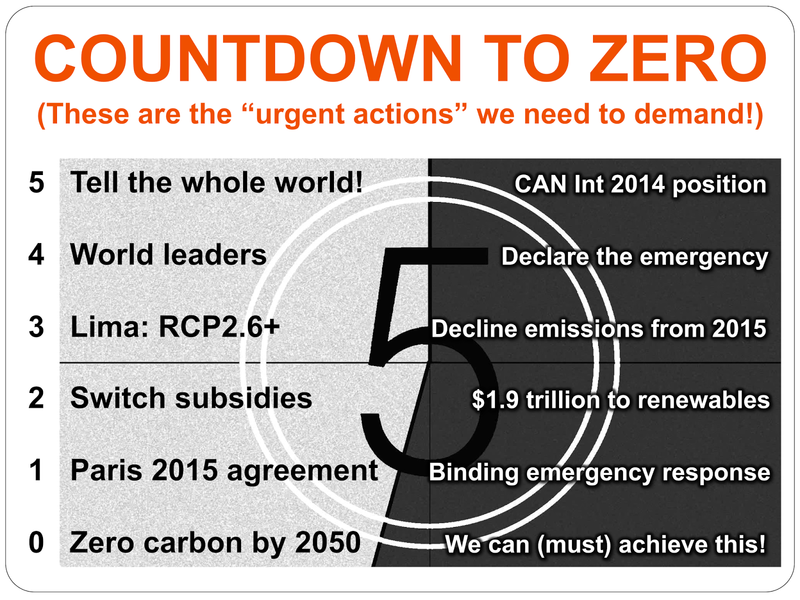 Demand that world leaders declare we are "beyond dangerous interference with the climate system" (UN climate change convention), that climate change is an emergency (follow the Green Party of Canada lead), and that the warming limit should be less than 1.5ºC. Insist that governments stop all fossil fuel subsidies ($5.3 trillion per year, according to the International Monetary Fund, 2015) – and switch them to clean, everlasting energy technologies and new fossil-fuel-free agricultural methods. Put a price on carbon while we're at it, so that fossil fuel and other corporations are paying for the currently "externalized" detrimental effects of carbon emissions. In Paris, get the most important agreement in the world signed, one that calls for carbon emissions to start declining immediately and to reach zero by 2050. Achieve zero carbon emissions by mid century, giving us that hope in hell of avoiding catastrophic climate disruption. 1. Ask world leaders to declare that climate change is an emergency, because the probability and the possible magnitude of the risks are too high. 2. State that a 2ºC rise in global average temperature is catastrophically high (due to the unaccounted-for warming from carbon feedbacks, especially in the Arctic), and therefore 1-1.5ºC must be our limit. 5. Demand that governments stop subsidizing fossil fuel corporations, switch those subsidies to perpetual energy technologies, and put a price on carbon. While strongly supporting and endorsing what you are attempting to do, I wonder how we assist people in becoming compassionate in this war-torn, traumatized world. For many of us it has taken years to find compassion. Who shows much compassion these days when it's barely fashionable to smile? My message, therefore, is to encourage compassion in ourselves first, then for one another and then for climate change emergency and all the other changes that must be made in our beautiful world - if only we care to look. "writing on challenging social issues"
Thanks for writing! I don't disagree that we need to be compassionate toward ourselves, but I'm hoping we can do it all at the same time -- a great global recompassioning! We just don't have time to put ourselves first anymore (the 80s and 90s, anyone?) ... so let's include ourselves as we open our hearts to those less fortunate and more vulnerable who are already being ravaged by the impacts of climate change. Let's include ourselves as we try to put the children -- of all species -- and all future generations at the centre of our deliberations on climate change. Let's include ourselves as we realize the importance of a stable climate to the biosphere that keeps us alive and fight to keep it viable. Compassion is "suffering with." Believe me, we can either be compassionate now, or we can suffer with everyone else on this beautiful planet in the not too distant future.